Forget about sci-fi and spaceships... This time Max Büsser goes with the 1940s Streamline flow. 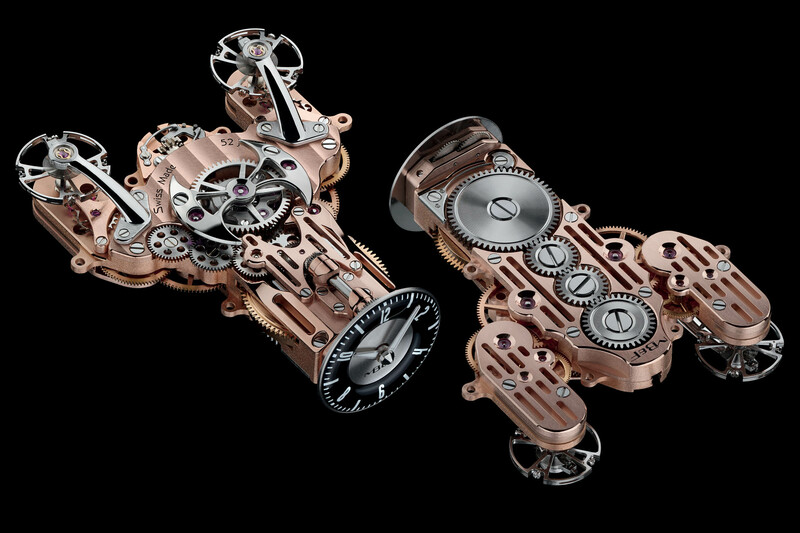 The big day has arrived for MB&F enthusiasts, or those of you who have been following the Horological Machine series since 2005. 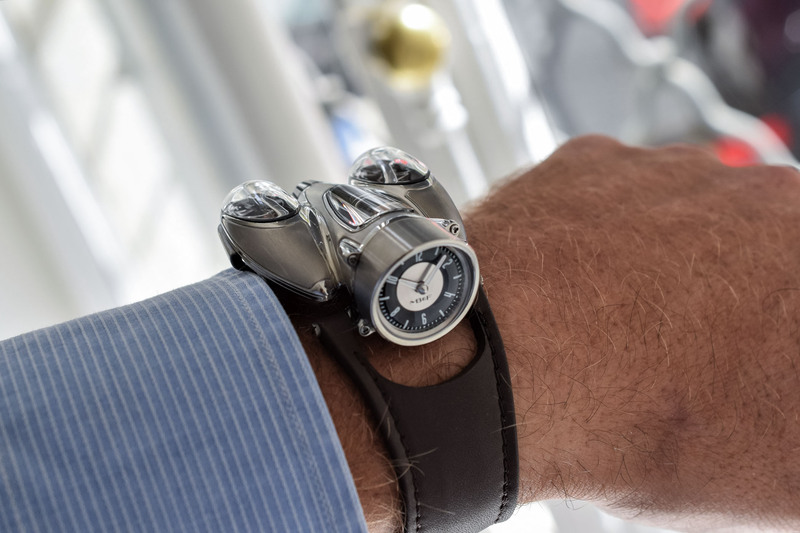 The latest opus in the series, the HM9, has just been unveiled… A new, unconventionally good-looking, mechanically complex and design-centric creation inspired by one of Max Busser’s countless dreams and passions… pure MB&F! And today, we have it live for you here, on MONOCHROME. HM9 Flow is a tribute to a period when the search for perfect aerodynamics was a field in which aesthetics were paramount, an era that gave birth to some of the most beautiful man-made objects ever created – MB&F lists the Mercedes W196 Streamliner, the 1948 Buick Streamliner or the de Havilland Venom as some of the most striking creations of the period. Automotive or aeroplane “streamline” was all the rage in the 1940s and 1950s. Before the invention of wind-test tunnels or CAD, automotive design was more about sensual twists and turns than about equations and the pragmatism of modern aerodynamic engineering. 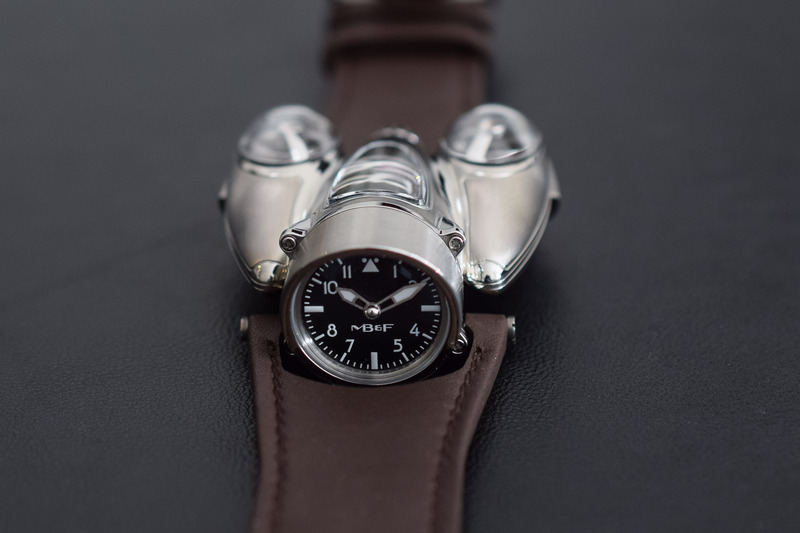 The result of this inspiration is a sleek, retro-futuristic aircraft or sportscar (depends on how you prefer to see it), a new horological UFO to be worn on the wrist. HM9 still relies on the codes used by the brand in the past: a bit of HM4 for the conception of the case and the display, the organic shapes of HM3 Frog or HM6 Space Pirate, the driver’s orientation of HM8 Can-Am. 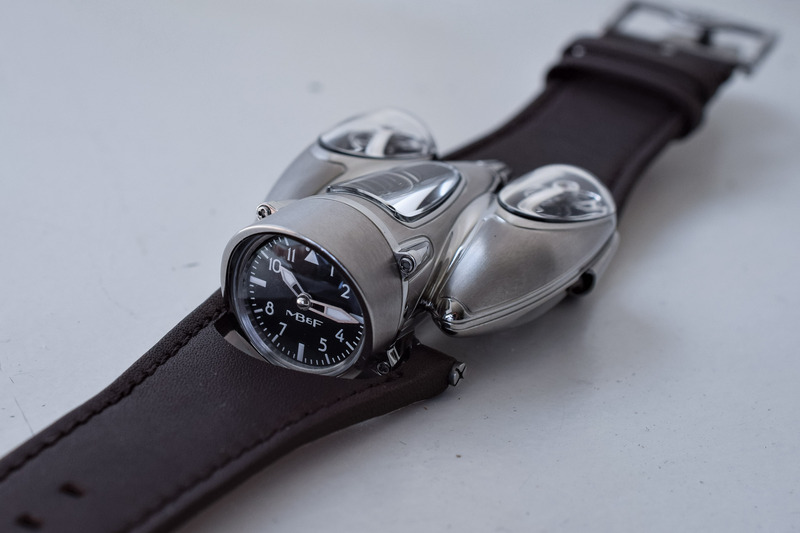 The new MB&F HM9 Flow is reminiscent of a streamlined jet engine flanked by two aerodynamic, ogival pods with drop-shaped sapphire domes housing twin balance wheels. 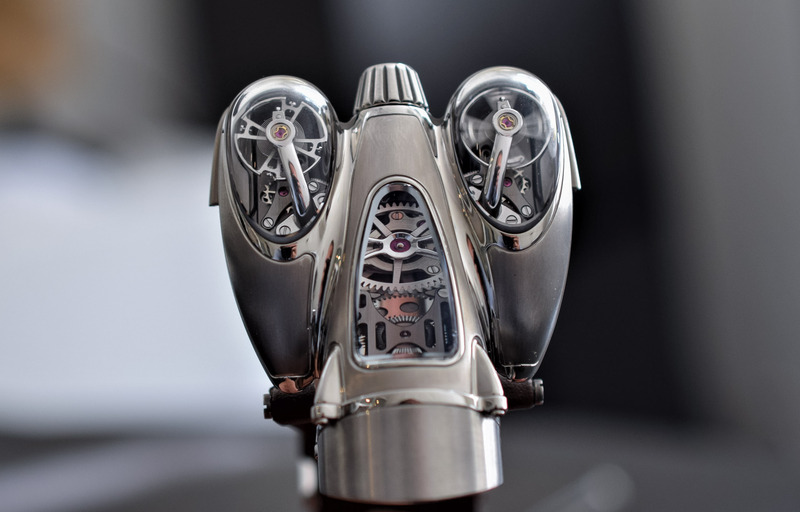 In the centre, a third sapphire crystal offers a superb view of the engine and its differential secured under a battle axe-shaped bridge (a traditional MB&F design feature). 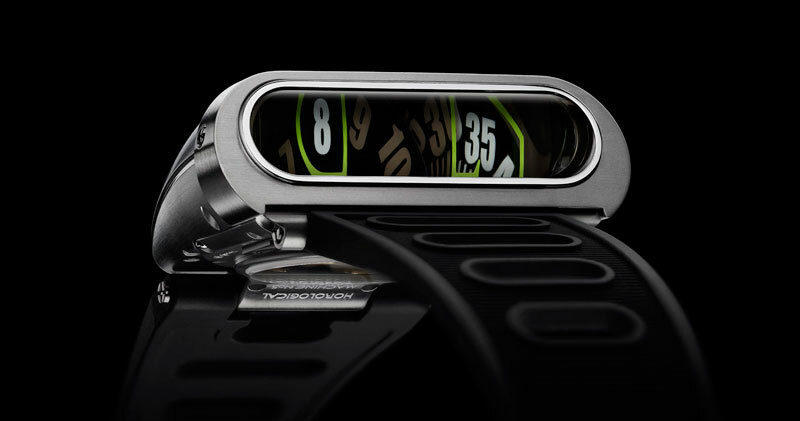 The vertical display showing the hours and minutes is another recurrent feature of MB&F’s driver’s watches. 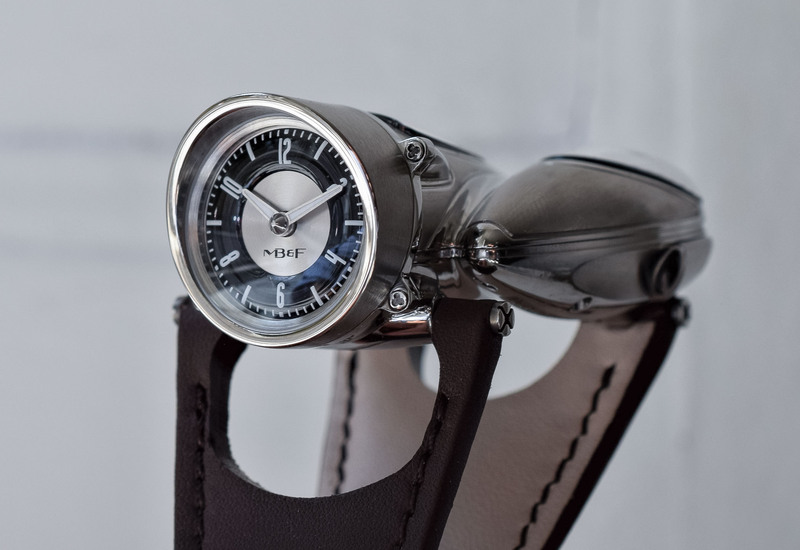 Inspired by yesteryear driver’s watches, it lets you consult the time without having to raise your hand from the steering wheel. 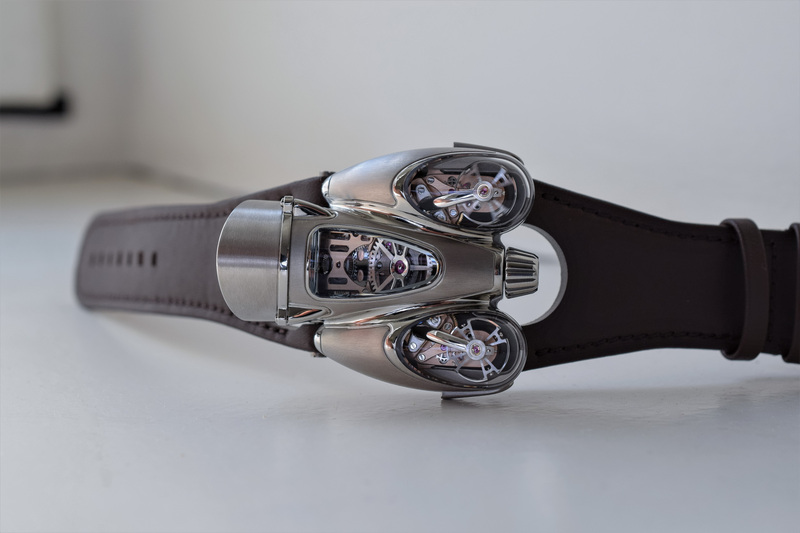 The exuberant yet aerodynamic case of the MB&F HM9 is large, as often with Büsser’s creations, at 57mm x 47mm x 23mm. Despite the impressive shape and size, it wears comfortably on the wrist thanks to well-designed lugs and strap. 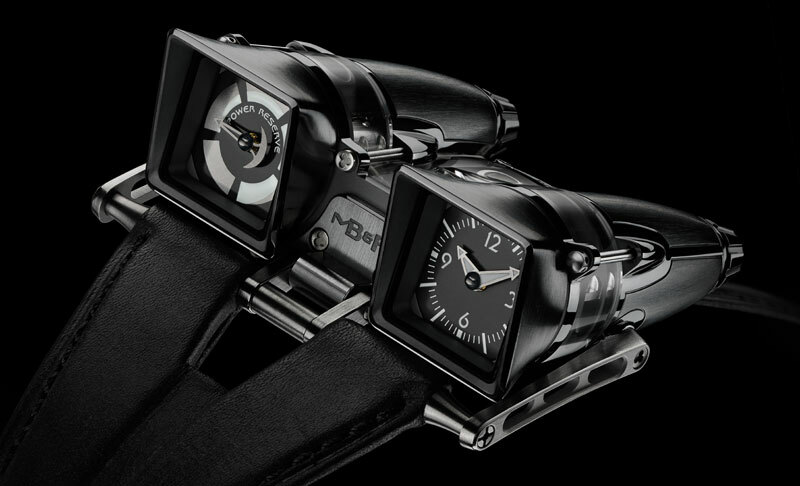 It is fashioned out of titanium, alternating satin-finished and mirror-polished parts, accentuating its steep curves. Its three-piece construction features no fewer than five sapphire crystals, offering multiple views of the movement inside. 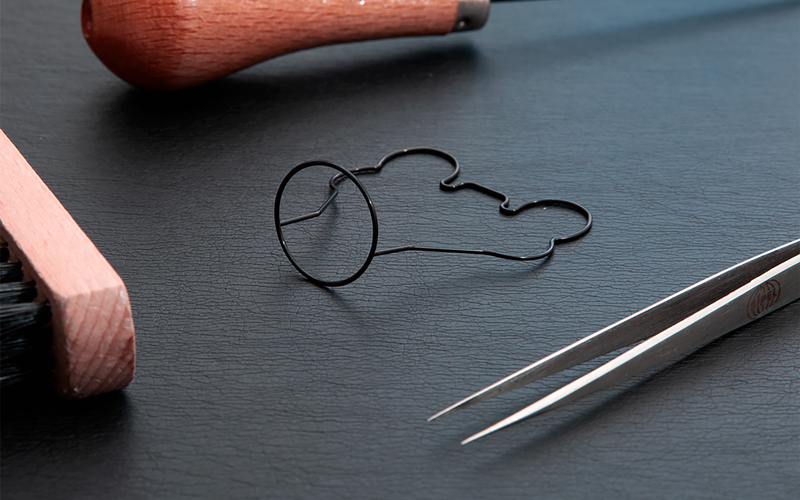 Despite its complex design, the case is water-resistant to 30 meters thanks to a patented three-dimensional gasket. 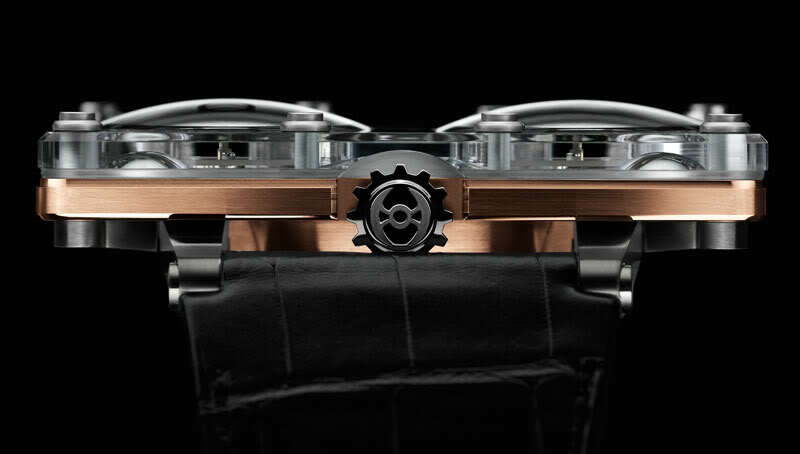 The HM9 is powered by a purpose-built engine shaped just like the case – making it quite a complex movement indeed. This in-house mechanical movement is regulated by two oscillators operating at 18,000 vibrations per hour. 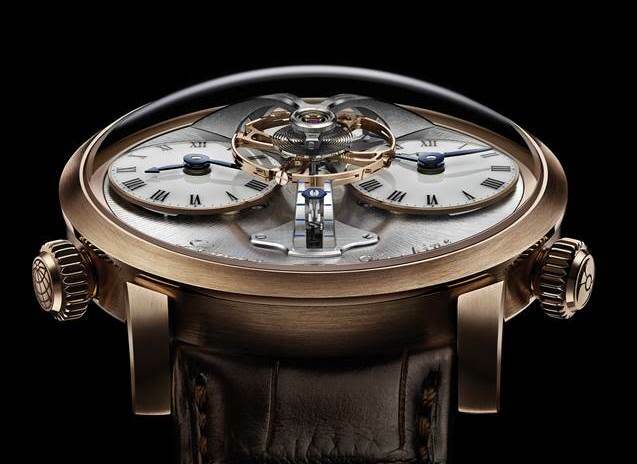 These are held under mirror-polished curved bridges reminiscent of the MB&F Legacy Machines. In the centre, a differential averages the rate of the two balance wheels – a concept that was first found on the Legacy Machine 2. The barrel can store up to 45 hours of power reserve. The winding crown is located at the rear of the body, to drive the in-line central gear train. Finally, a conical gear transmission is used to drive the vertical display. 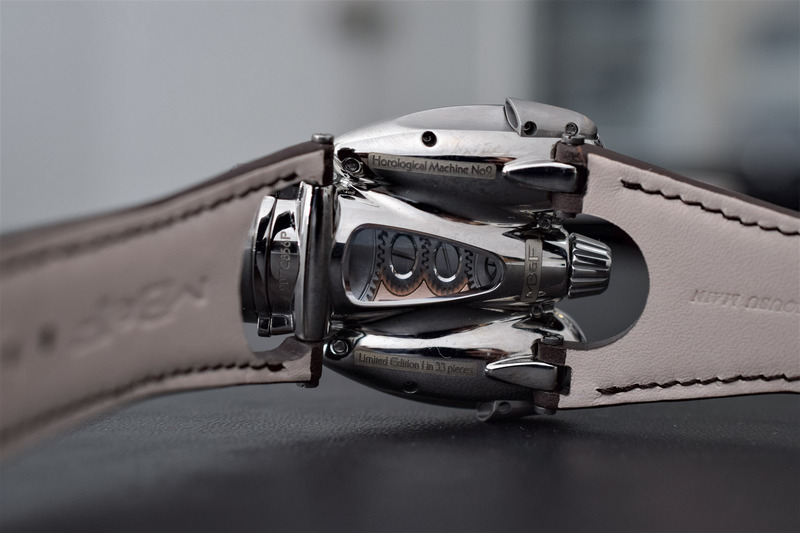 Overall, the movement comprises 301 parts, which are all finished with great attention to detail. 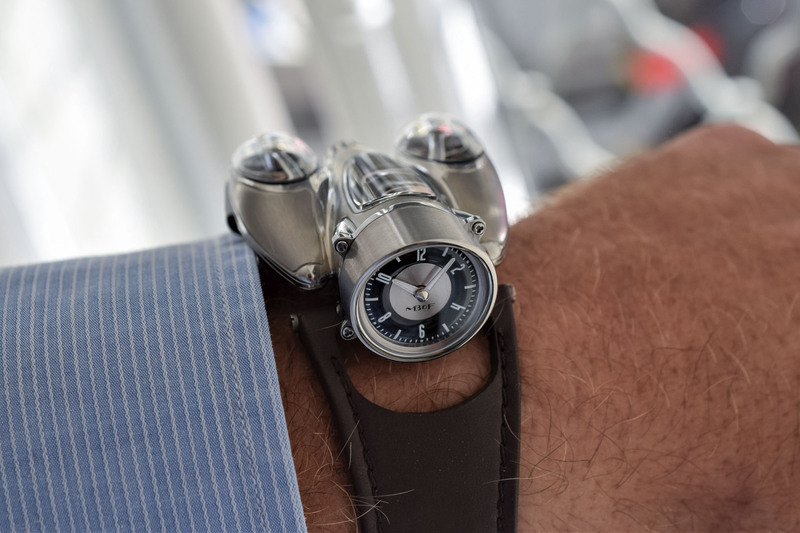 The MB&F HM9 Flow debuts in two limited editions of 33 pieces each. 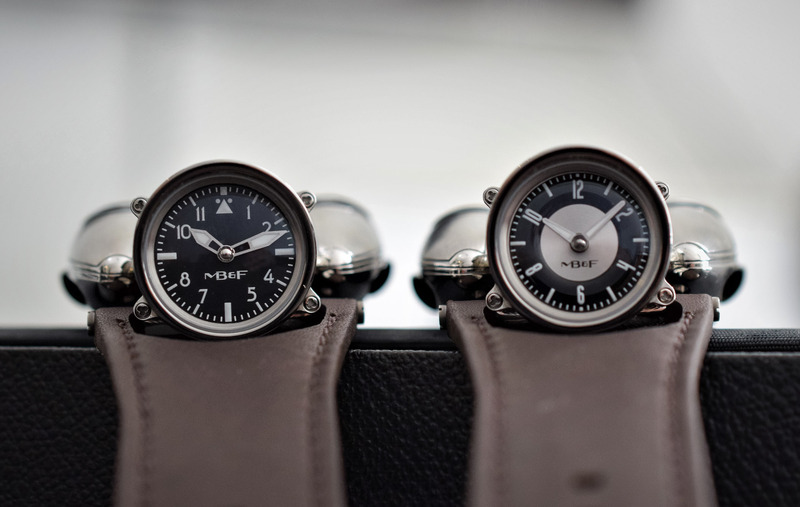 The Air Edition comes with a typical pilot’s watch dial (with a triangle at 12 o’clock and propeller-shaped hands) and is powered by a dark NAC-coated movement. The Road Edition features a rose gold-plated movement and a dial reminiscent of vintage dashboard speedometers. The HM9 is worn on a hand-stitched calf leather strap secured with a titanium folding buckle. Price is set at CHF 168,000 (before taxes). 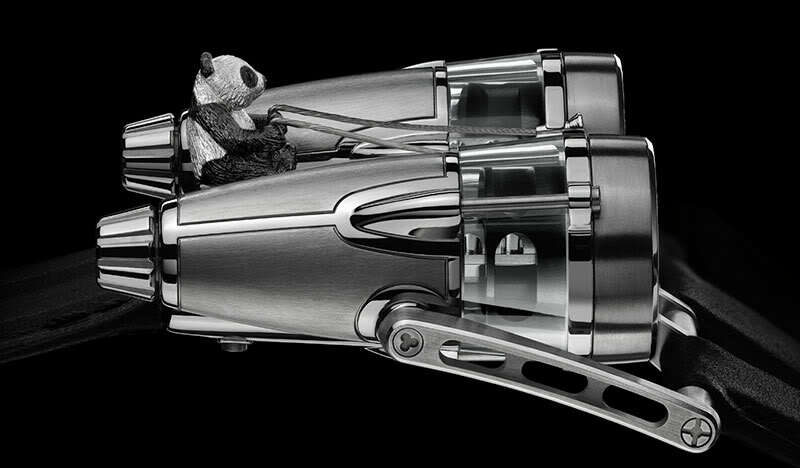 For more information, please visit www.mbandf.com. Can you use it as a desk clock if you take it off the strap? Well, I would not remove the strap to use it as a desk clock, but it is quite cool when on a desk with the lateral display. These editions are fun, design centric experiments that give interest to horology in general and are certainly collectable to a few. I like this one the best yet….its so far out there…..even farther than the frog, which was amazingly daring for its time. I love the deco rocket man styling and fine calibre finishing. I wouldn’t wear this if paid, but love its courageous ability to fill its own niche and would own one if it the money it took was inconsequential. A continual quibble with these MBF art fantasies is the fact that they don’t have any complications other than time of day. They should really do something clever, even if its just visual and kinetic.